When the Masarians attack Gaven's people, they are defeated and Gaven himself is taken captive by a man claiming to be his father. It turns out his entire life has been a lie, and now his "father" will deliver him into the hands of another man to indoctrinate and train him. Gaven vows he will never shame his people by giving in to the Masarians' way of loving other men. Gaven learns that being Vlar's pupil in all things is a mixture of pain and pleasure. He hates his Finnarian teacher...doesn't he? Yet his body betrays him time and again, especially when he experiences the sexual ecstasy of a Finnarian bite and the giving of his own blood. There seems to be so much more to their relationship than either of them can understand, so Vlar calls in his father, a Finnarian prince. What he tells them shakes Gaven to his core and he fears he cannot possibly live up to what Vlar wishes of him. Just when they seem to be on the edge of truly discovering each other, a shadow from Gaven's past comes to shatter it all to pieces. Draconian -Finnarian -a match of war. The immortal Finnarians mate for life, and once they find their mate, nothing on earth can make them leave. But what about when that mate is not Finnarian at all, but a stubborn, fiery, extremely irritable Draconian? What if that Draconian wants nothing at all to do with his Finnarian mate? It seems the Finnarian prince, Sadan, is going to have his work cut out for him. 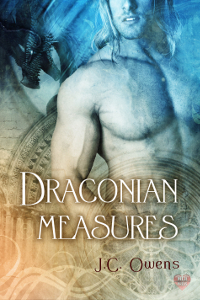 Fortunately, he is just as stubborn and far more persistent than said Draconian has ever had to deal with. Graitaan is the last remaining Draconian and he has attracted the eye of a Finnarian prince, who claims that he is his bloodmate. Sadan may want to be mated, but Graitaan has developed a passionate hatred for his Finnarian commander, prince or not. Too bad Finnarians are persistent as the hells. Especially this one.